This is the picture that Carole sent me! Finish the piece by doing one row of sc across the other side to make the bottom edge of the robe look even and neat. The collar of the robe should just naturally fold back on itself, but if it doesn't you can adjust it as you put it around your bottle. Overlap the short edges of the robe and use the belt to hold it in place. I put the robe and the belt on the bottle before I sewed the pockets in place. That way I knew I was pinning them in an area that wouldn't be hidden by an overlapping flap, and that they wouldn't be placed too far out on the sides to show. 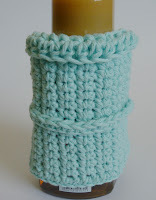 Definitely pin them in place while the robe is on the bottle, then you can take the robe off and tack them into place. I think it would be very cute to add a little tissue sticking out of one of the pockets... Hmm, I may have to go do that right now... LOL!!! I was talking with my dad about this project, and we got to laughing about how cute this would be if it was wrapped around a hand sanitizing gel bottle. That and a box of tissues would make a great gift for someone who has a cold. My mom (who's an elementary school teacher) then chimed in that it would be funny for on her desk too. She said that she could threaten her kids, "You guys better use this hand sanitizer after you cough or sneeze or I'm going to get sick and have to stay home wearing one of these robes!" Ah, my parents crack me up! Way too cute, great job! Hi Nyan! Thanks! It was a fun challenge! I agree! I think that would be super cute! Hi Teeni! The pockets were my favorite part too! It's definitely the idea to dress up christmas gifts and make it special. Thank you. Hi Elayne! Thanks! Send me a picture when you're done and I'll put it in the Dynamo Gallery! 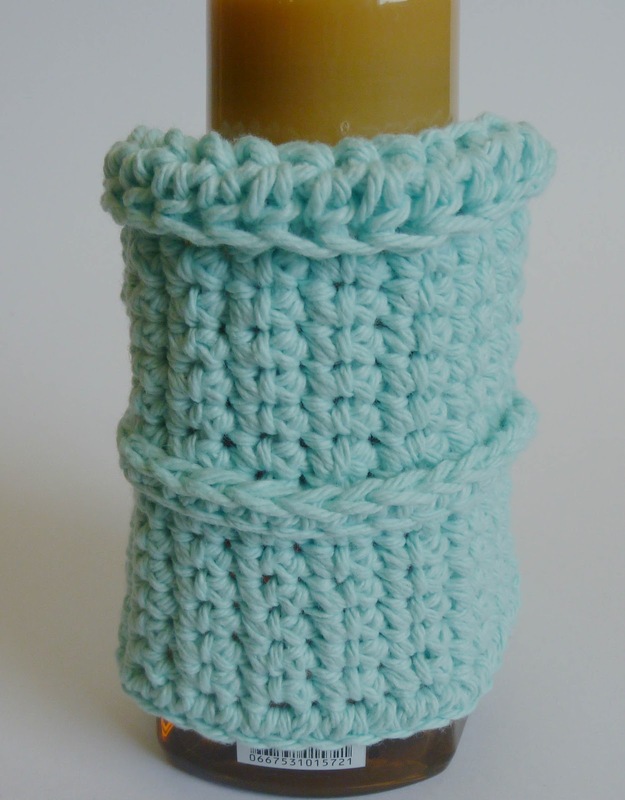 Since my bottle is about 3 inches across and 5 inches tall, how many stitches would you suggest before decreasing? I have already started it. Thanks Jaime. Also we live fairly close, I am in Lakewood. Whoops, it is 2 1/2 inches across X 5 1/2 high, not around. It is The Clean & Clear Morning Burst facial cleanser, got it at Walmart. 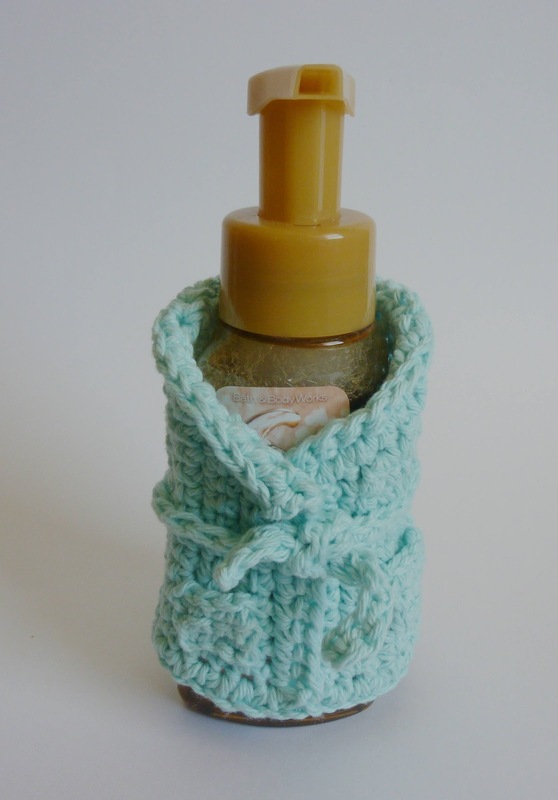 Okay, the robe measurements are 4 1/2" tall at the tallest point, which I think would work well for your bottle. It measures slightly over 8" wide, which I'm thinking might be a little too much overlap for your bottle. You may have to experiment a little, but I would start by taking out 6 of the 15 stitch rows (Rows 12-24 are all 15 stitches long). I'd love to see how it turns out. I love this! It would be perfect for different situations, being sick at home comes to mind first. Thank you so much for sharing! I can't wait to make some of these to have on hand. Hi Karen! Thanks so much! They make fun presents, too! These make great table decorations or hostess gifts if you're bringing a bottle of wine for dinner. Also a nice Valentines Day gift.